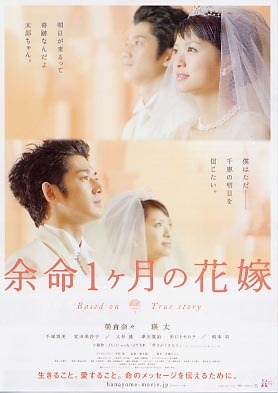 Based on the true story of Chie Nagashima, a women afflicted with breast cancer and her husband Taro Akasu. Chie Nagashima's story was also told in a 2007 TBS documentary. Suryastuti Feb 01 2014 3:27 am Watashi wa Tarō no yōna honmono no pātonā o mitsukeru koto ga dekireba dorama wa, hijō ni kandō-tekidesu. Gina Salise Feb 28 2011 9:57 am i saw the billboard of the movie when i went to hong kong but haven't watch the movie. it was last year that i bought the dvd copy of the movie and it's very beautiful. i can't help myself from crying. it's a very touching movie. i wish to find a man just like taro akasu who's willing to sacrifice for the woman he love and will take care of her and accepted her no matter what. mel Sep 27 2009 12:08 pm i watched this on Cathay on the NY-HK route a coupla days back! it's a wonderful movie indeed. the soundtrack is called the rose by bette midler. resung by leann rimes. check it out on youtube? I am a South African recently travelled to Korea on Cathay Pacific where I saw this movie. Very moving, well acted movie. I am interested in the sound track that plays at the beginning of the movie and at the end of the movie (at the wedding). I would like to get a copy of the song. Please send me the details of the song and singer, and where can I get it?